The bicycle tour follows the old rail line. 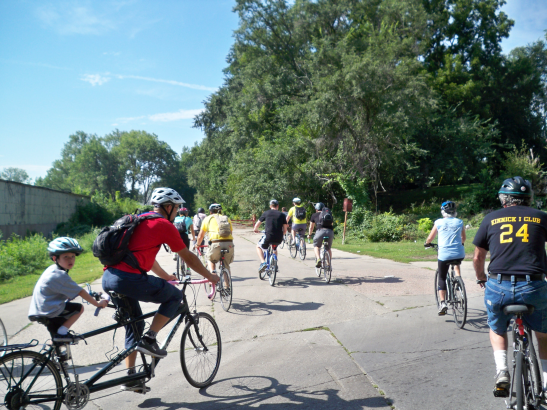 On Saturday, 9/7, I joined a bicycle tour of part of a proposed pedestrian/bicycle trail and passenger rail line that would run between North Omaha and Offutt Air Force Base. About 50 riders divided into groups led by designers of the proposal. My group leader was architect Geoff DeOld. Beginning at the Charles B. Washington Public Library at 29th St. and Ames Ave., the tour viewed the northernmost portion of the former rail route as far south as Hamilton St. You can see a map on page 2 of this brochure. The Malcolm X Memorial is near the old rail line. Although I knew the area well from having ridden my bicycle along this route to get to work, I had never known that I had been passing a former railroad right of way. Along the way, we passed Metro Transit’s North Omaha Transit Center (under renovation), the Malcom X Memorial, and beautiful Adams Park. Geoff pointed out potential station sites and the wide range of landscapes along the route, including urban intersections such as 40th and Lake Streets, residential areas, forest, and grassy fields. 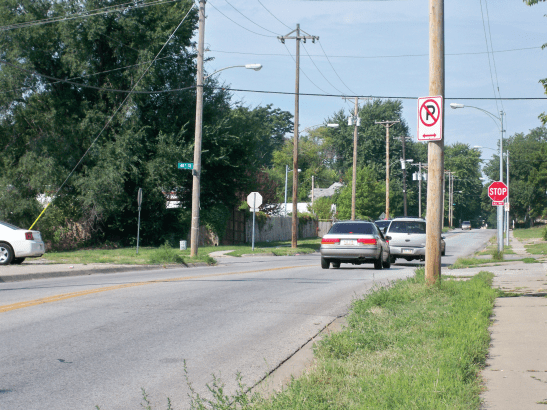 The intersection of 40th & Lake Sts is a potential site for a transit station. Emerging Terrain imagines this rail line as part of a proposed bus rapid transit (BRT) system for the Omaha metro. It’s one of several transit options to consider as we work together to create a vision for the future of transportation in Omaha. Mode>Shift>Omaha works for a future in which all metro-area residents will enjoy the freedom, opportunity, and autonomy that comes from having many transportation options and welcomes efforts to expand these options. This trail would be a welcome addition to so many in Omaha.